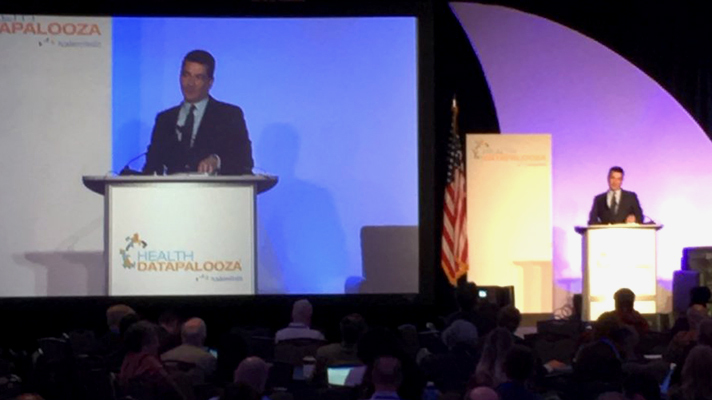 Scott Gottlieb, MD, is bullish on the opportunities artificial intelligence could bring to EHRs, decision support and more. At AcademyHealth’s 2018 Health Datapalooza on Thursday, the U.S. Food and Drug Administration offered a vote of confidence for artificial intelligence in healthcare, promising more refined strategies for regulation, touting its tech incubator for AI innovation and announcing a new machine learning partnership with Harvard. "We’re implementing a new approach to the review of artificial intelligence," said FDA Commissioner Scott Gottlieb, MD. As one example, he pointed to the agency's approval earlier this year of a new clinical decision support software that uses AI algorithms to help alert neurovascular specialists of brain deterioration faster than existing technologies. "AI holds enormous promise for the future of medicine, and we’re actively developing a new regulatory framework to promote innovation in this space and support the use of AI-based technologies," said Gottlieb. "So, as we apply our Pre-Cert program – where we focus on a firm’s underlying quality – we’ll account for one of the greatest benefits of machine learning – that it can continue to learn and improve as it is used." FDA also plans to ensure its regulatory framework and software validation tools are "sufficiently flexible to keep pace with the unique attributes of this rapidly advancing field," said Gottlieb. Whether tools that can scan digital biomarkers for early diagnosis, or leverage EHRs to enable clinical trials at the point of care – or even technology that someday "might even be taught to explain itself to clinicians – Gottlieb said he's excited about the prospects for AI in healthcare. FDA has also recently launched a fellowship program with Harvard on AI and machine learning, which is focused on designing, developing and implementing algorithms for regulatory science applications, he added. "It’ll look at developing new clinical endpoints and signal detection methods for evaluation of the safety and effectiveness of therapies," said Gottlieb. "These efforts also will help us develop new approaches for understanding variations in individual patient experience using diverse data sets from clinical trials, EHRs and biometric monitoring devices."